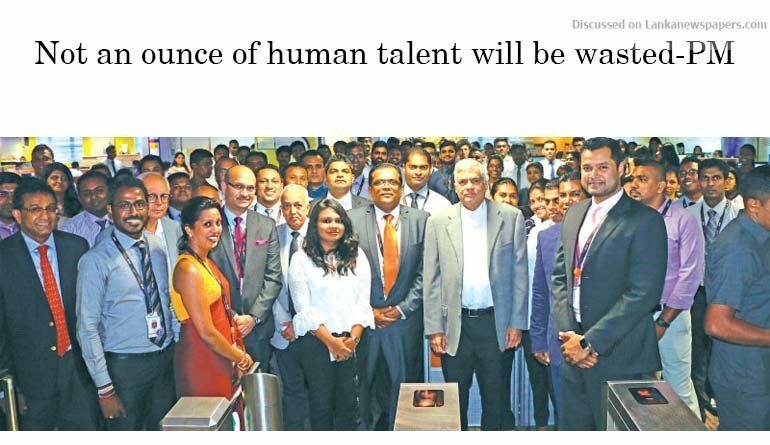 Prime Minister Ranil Wickremesinghe pledged not to waste even an ounce of human talent in Sri Lanka when he addressed employees of WNS Global Services (Pvt) Ltd, one of the pioneer IT-BPM operators in Sri Lanka. Quoting Parakramabahu the Great that not one single drop of water would be allowed to flow to the sea without being fully utilized, Wickremesinghe said his government would employ a similar approach towards the country’s talent pool. The Premier said that IT and related industries are crucial to the country’s future and committed to provide the support required to grow the industry. During his visit the Prime Minister met with Dinesh Wickremanayake, Managing Director, WNS and senior representatives of the company. Minister of Development Strategies and International Trade Malik Samarawickrama and the Director General of the Board of Investment of Sri Lanka (BOI), Duminda Ariyasinghe also participated in the discussions on expediting the country’s future IT growth. WNS started its operations in Colombo with 35 employees in 2004, and today it has grown its presence to over 700 employees across two locations. Following extensive private and public stakeholder consultations in 2017, Sri Lanka’s National Export Strategy (NES) identified ICT to be one of the six priority sectors in strengthening export competitiveness and sustainable investment growth. The IT/BPM industry aspires to grow its export revenue from US$ 1.2 bn at present, to US$ 5 bn, provide employment to 200,000 people and enable 1,000 startups by 2022. With the potential to become one of the leading export earners for Sri Lanka, the IT/BPM industry will see the development of related infrastructure facilities, capacity building for talent and improvements in ease of doing business as part of the implementation of government policy objectives. These initiatives will complement the industry’s strengths and fuel its growth, positioning Sri Lanka as a hub for world-class knowledge solutions.